Seeing Things focuses on the artistic deconstruction of racial and ethnic profiling. Through video and conceptual installations and social sculptures, Ann Stoddard is inquiring: Are we seeing things? Is our vision warped by implicit bias? Can art and technology increase empathy? Public space is open and borderless, with layered contexts and contradictory points of view. The “SEEING THINGS” series responds to the profiling of and violence against Black men, and to the banning and profiling of Muslims. 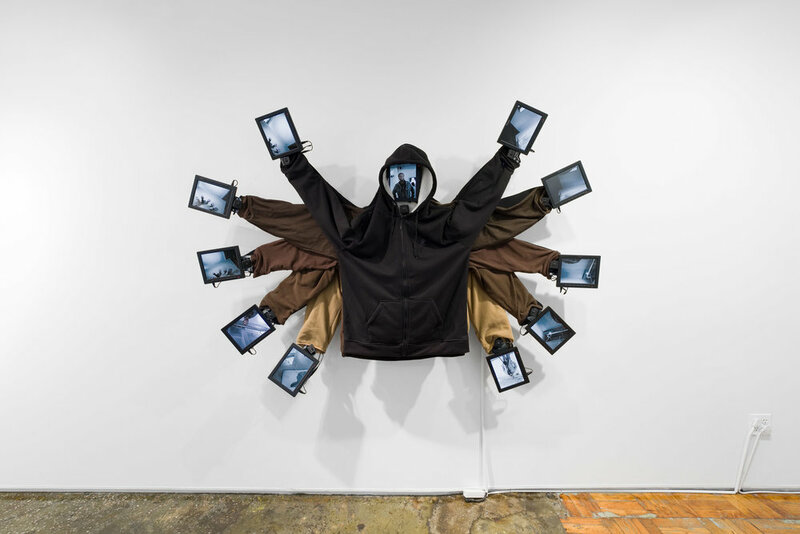 “SEEING THINGS”- installations, social sculptures, videos- proposes the artistic deconstruction of racial and ethnic profiling, and asks viewers: Are we seeing things? Is our vision warped by implicit bias? Can art and technology increase empathy? 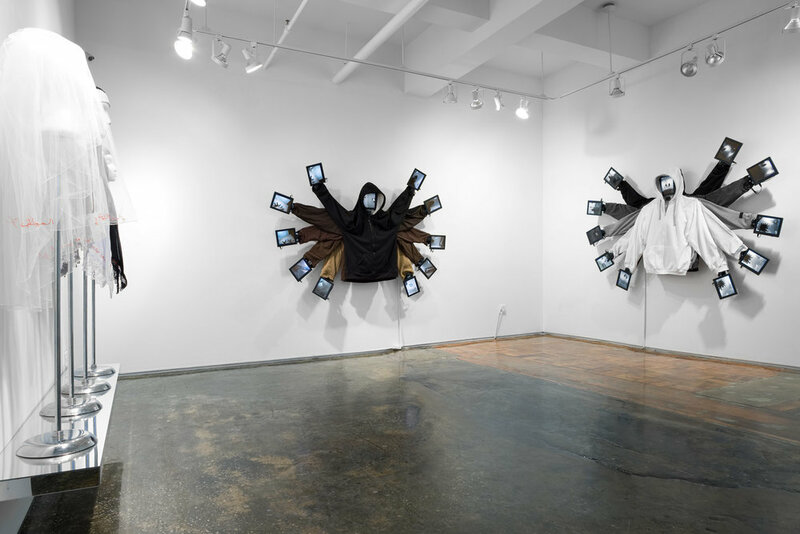 Works responding to systemic post-9/11 ethnic profiling of Muslims are informed by living and teaching in Morocco, a Catholic girlhood, instruction in embroidery and sewing, and activism. 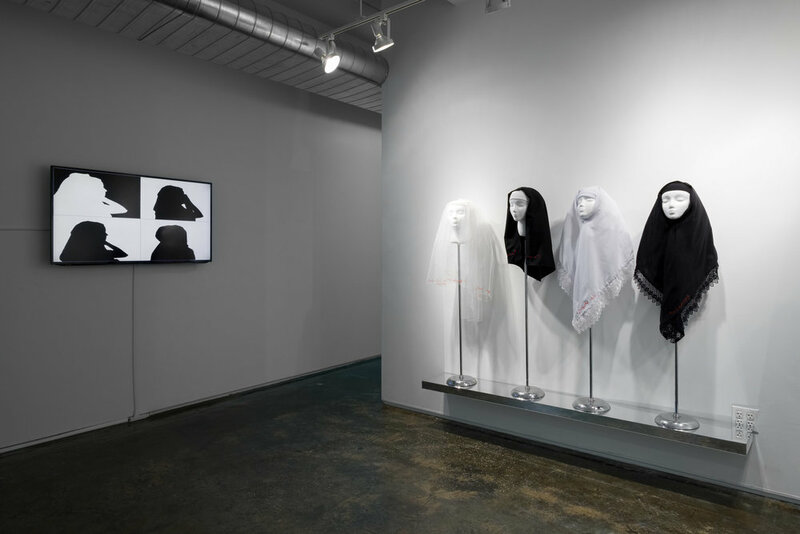 The 4-channel video installation “Seeing Things, Headscarf” displays random juxtapositions of a woman donning a scarf in a black-and-white quad-screen video, conceptual art and fashion transcending stereotypes: What’s the big deal about headscarves? Who decides when scarves are fashion, when they signify devotion, - repression? Riffing on the popular video "100 ways to tie a scarf", “Seeing Things, Headscarf” sources include Audrey Hepburn wearing scarf-and-sunglasses in "Charade", Hijab, bridal veils, the Virgin Mary. “BARED THREADS” [installation] is a faux store display of veils with subversive textual reinscriptions. Bold crimson embroidery (artist’s) reveals commonalities of fashion across cultures in a post-9/11 context of ethnic profiling. “Kemar” (face veil) is inscribed in flowing Arabic across a Western ‘fingertip’ wedding veil, while a white Hijab reads “Fingertip Veil.” “Headscarf” is scrolled across the black Hijab, while “Hijab” is inscribed in Arabic across a nun’s veil. Reverse labeling challenges traditional Western assumptions and implies awkward questions: How does a Western wedding veil covering the face differ from a burqa or niqab? Who decides when veils are fashion statements, when veils signify repression?